I’m at a loss to where to take these exactly. They are a few testers of a larger force. They ended up blue by default because I’d loaded an airbrush with blue for something else, had left over, and just sprayed them as they were near by. A ‘near-by spraying’? As you can see, 3 of them are assault troops with shields and hand weapons. I can’t for the life of me decide what (if anything) I should paint on their shields or other markings for that matter. Mental block. FYI. These are old miniatures no longer available for legal reasons (I believe). Once upon a time produced by The Scene. Their current range of ‘Wasteland’ warriors are echoes of some Space Ork sculpts also once available (and in my possession to be painted). 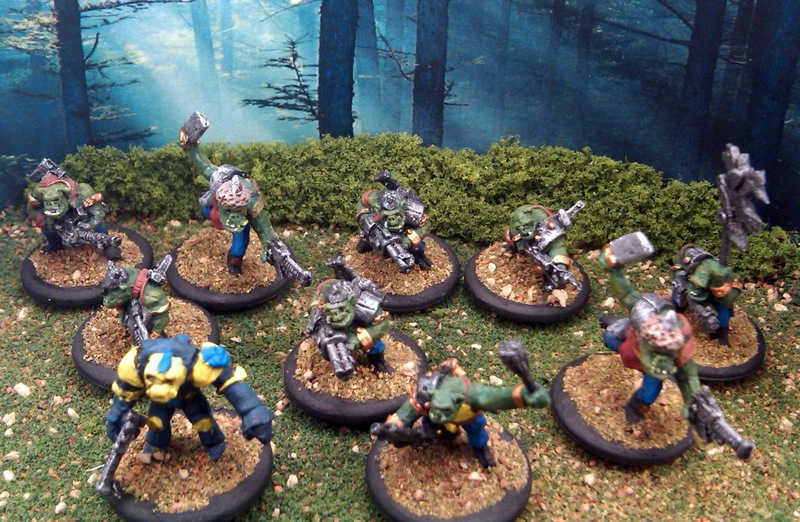 15mm 40k anyone? Hi Dan – have 20, all unique variants. T0 me that equals 3-4 squads. I well know you are the master of 15mm 40k stuff – great work there – but I don’t know if I want to stamp these 40k hence my silly indecision. If I can I try and deviate from the ‘obvious’. 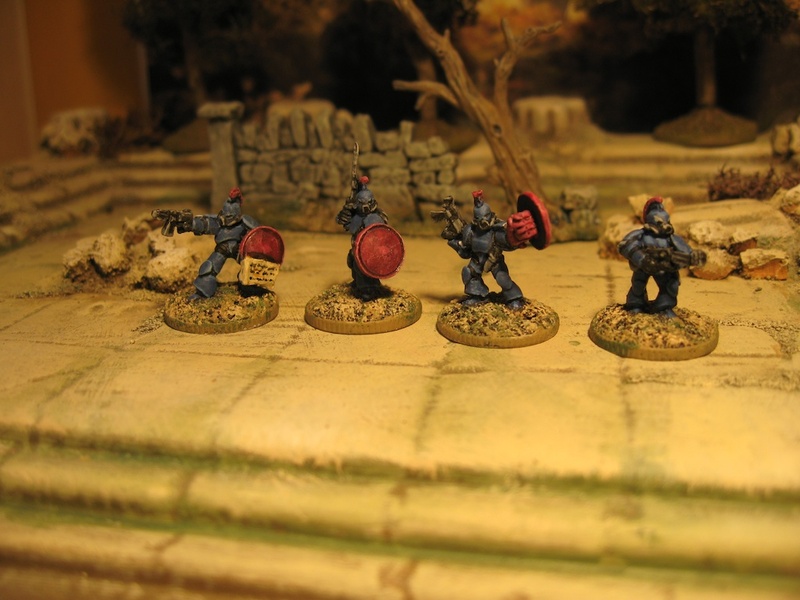 I’ve a few little big men shield transfers for Greek hoplites left over which I might use…. You mean the ones from The Scene I mention? I think they are very Gorkamorka personally. I’ve yet to paint mine but did pick some 2nd hand ones up painted and they look spot on to me. (I don;t mean the ones you can see on their site at the moment btw to be clear).